This is a Modern period French advertising poster for Coca-Cola. It is a beautifully crafted modern period poster that captures the effervescent and relentless upbeat style of twenty first century soft drink advertisements – but with a surreally minimalist style that makes this piece truly one of a kind. The image is dominated by the conflict between an overwhelming monolithic red background and a simple white coke bottle with a huge multicolored psychedelic spray of images shooting out of the top. The triangle shaped spray – which almost appears to be a spray paint collage – features a mix of images, ranging from flowers and butterflies to a man giving a peace sign. 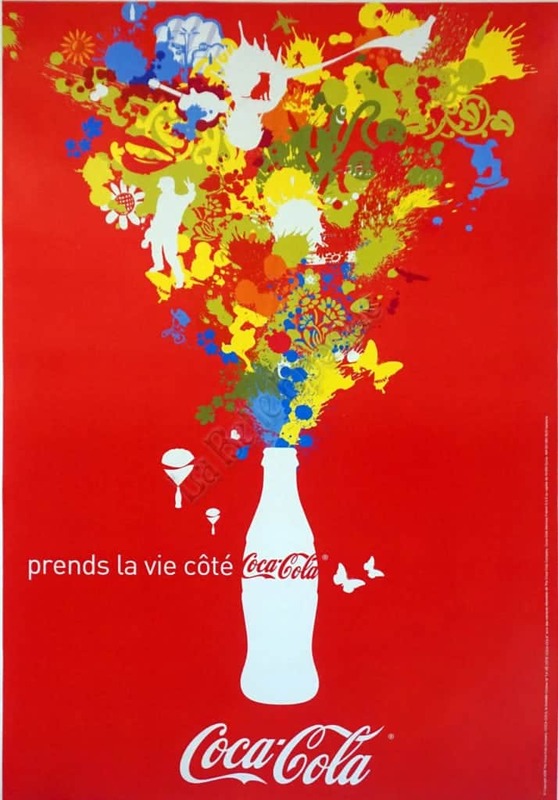 To the left of the Coke bottle, in a minimal white typography, the poster reads in French: “Take on life on the Coke side.” Finally, at the very bottom-center, Coca-Cola is written in the classical font of the brand, reinforcing the chaotic and energetic verticality of the design. This is a playful and energetic poster that highlight the best of twenty-first century poster design.